Who Invented The Cochlear Implant? Adam M. Kissiah, Jr. Invented the Cochlear Implant! Henry Ford’s “Model T” automobile of the early 1900s, and the Cadillac of the modern era have the same BASIC design. All cars possess a frame, 4 wheels, power source, transmission, steering wheel, and brakes, etc., but differ greatly in the details of final design. 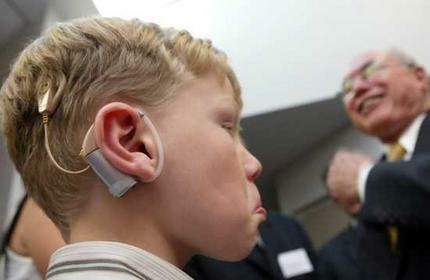 Likewise, all cochlear implants MUST incorporate the same BASIC design to be capable of “detecting” or “demodulating” intelligence from the human voice (especially) residing within an electronic signal. The successful cochlear implant must also be capable of converting the detected intelligence (pattern) into an appropriate electronic format for application to the acoustic (eighth cranial) nerve, which in turn further transmits the encoded pattern to the hearing center of the brain, where it is interpreted as meaningful information. That is why implants from ALL (three) major manufacturers work equally well in functionality, but are quite different in final design enhancements. Design of this basic conversion process was first described by Adam Kissiah and exposed to the public when it was revealed to James O. Harrell, Esquire, Patent Counsel to NASA’s John F. Kennedy Space Center, in July, 1974. Mr. Harrell also advised exposure to another person capable of understanding the concept. This was done on August 01, 1974. Subsequent Patent Office search and patent application for letters patent was completed in May, 1977. Patent 4,063,047 was issued to Adam M. Kissiah, Jr. on December 13, 1977. Reissue 31031, which further improved design, was issued on September, 1982. Some designs and intra-cochlear implants were made by others prior to the time periods above, and were considered “successful” from a surgical and medical point of view, with an equal number of proclamations and claims of being “firsts” in cochlear implantation. Indeed, many important advances in cochlear implantation were accomplished during the 1960s and 70s. These earlier implants were capable of providing background sounds, and provided some aid to lip reading, and thus enabled patients to attain a most welcome sense of “attachment” to the world of sound. These earlier implants were incapable, however, of providing significant comprehension of the intelligence of the spoken human voice. Greater understanding of voice intelligence was accomplished as the designs described in Patent 4,063,048 were utilized in subsequent cochlear implants. Although Adam Kissiah was a full time employee with NASA at the Kennedy Space Center, he participated as a consultant in an implantation program during the early 1980;s through license agreement granted by Kissiah to Biostim, Inc.
Biostim in turn participated (also by contractual agreement) with Stanford University, Dr. F Blair Simmons, principal investigator, during a series of cochlear implants during that period of time. Section 2: Adam Kissiah’s involvement in hearing research subsequent to the experience of personal hearing loss onset in the Early 1970s, deriving design of basic specifications for simulation of the electronic functioning of the inner ear (Cochlea) in humans. Section 3: How our natural hearing mechanism works, and how the Cochlear implant works in the correction of hearing loss. Section 4: Information regarding implant availability including manufacturers, costs, clinics, surgical aspects, and post-operative activation (therapy) considerations. Section 5: Sources for additional information.